Economic theory indicates that immigration should have a long-term positive impact on economic growth; theory also suggests there are benefits from immigration in the form of better returns to capital. Theory also supports increasing the amount of immigration in order to boost GDP via population growth, improve the efficiency of labor allocation, and support the Social Security system. However, lower (short run) returns to labor are politically explosive and are part of the story behind our failure to pass immigration reform laws; the amnesty issue is another factor. New ideas on breaking the logjam include the "PILLAR" Act, which might resolve the debate over family-based vs. merit-based immigration; however, amnesty and a border fence remain as serious roadblocks to progress. Technology (QQQ) and healthcare (XLV) stocks will benefit from a move to a partially merit-based immigration system. But, for now, prudent investors should bear in mind the budget, immigration, and trade problems haunting the markets, and hold IAU or GLD, OTCRX, WHOSX, and TLT. 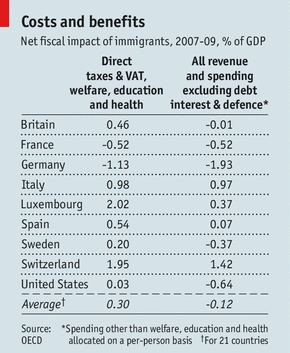 The empirical evidence on the economics of immigration is a bit more mixed than many in academia admit (cf. Part I of this series - Kevin Wilson, 2019). However, some academics do accept that there are groups of people that are hurt by the impacts of (especially illegal) immigration in the short run, and the fiscal costs to taxpayers during the first few years of a poor (whether legal or illegal) immigrant's life in America (Chart 1) are substantial (George J. Borjas, 2016; Michael Greenstone et al., 2012; The Economist, 2013; Francine D. Blau & Gretchen Donehower, 2017; George J. Borjas, 2017). In fact, The Economist (Chart 2) has compiled data showing that in the US, the net fiscal cost of immigrants in the 2007-2009 period was 0.61% of GDP, or about $94 billion. That is equivalent to about 10% of our 2018 federal deficit. 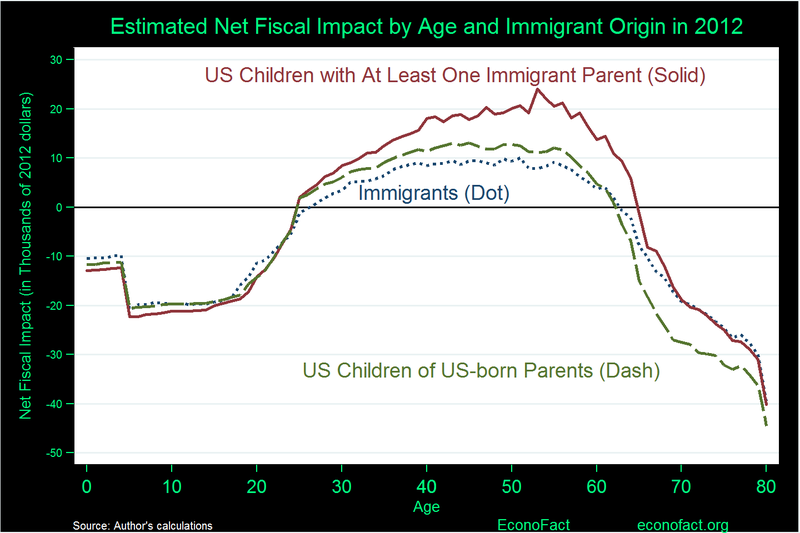 However, there are also many academic studies that indicate a net fiscal gain from immigrants over their entire life cycle (Chart 3). Common sense would indicate that since we are a nation of immigrants, and since immigration has always contributed to our economic growth via population increase, cheap labor, entrepreneurship, and invention, then the long-term effects of immigration are quite positive (cf. quotation above and other comments by George Friedman, 2019). As famed analyst and former refugee George Friedman has also pointed out, the two-centuries-long debate over immigration has long pitted those who are fearful about decreasing returns to labor, against those who are oblivious to these concerns because they are on the receiving end of rather good returns to capital. 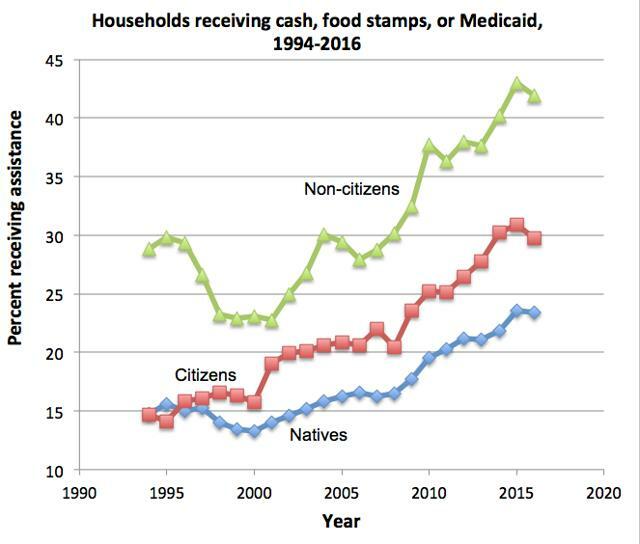 The costs of new immigration to relatively poor native-born workers and relatively poor but long-resident immigrant workers have always been significant in the short term, especially for the poorly educated in certain sectors of the economy. But these workers have in turn long been oblivious to the fact that immigration "is embedded in the nation's soul," and that in a time of declining birthrates, immigration is imperative if we are to sustain economic growth. For investors, there are several issues worth paying attention to in the immigration debate. Foremost amongst these is the need for continued immigration to keep population growth on track. 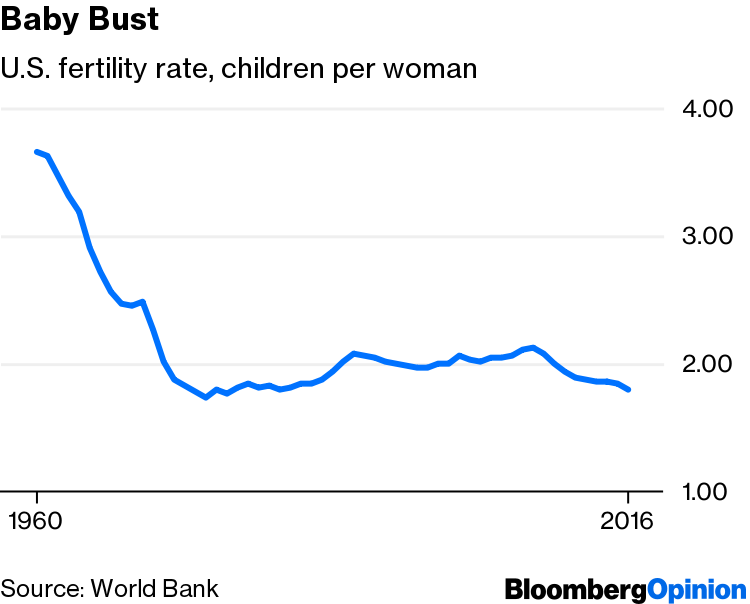 This is critical because the only two drivers for GDP growth are population increase and productivity growth, and both will have to improve for growth to rise above (and stay above) the rather tame levels of the recent recovery (i.e., the weakest one ever observed). Both have exhibited secular declines in their growth rates (with productivity growth nearing zero) in recent decades (Kevin Wilson, 2016a; Kevin Wilson, 2016b; E. Wesley F. Peterson, 2017). One of the main reasons the US economy has outperformed Europe and Japan over the last few decades has arguably been the strong immigration advantage enjoyed by the US over that time period. Another issue worth our notice is the apparently huge benefit accruing to the US economy from the legal immigration of highly skilled and/or highly educated workers. Perhaps, our policy should be to open up many more (a doubling or tripling?) slots for annual H-1B visas so we can attract even more immigrant talent. This might have a very wonderful effect on the competitiveness and profitability of the technology and healthcare sectors. Finally, the apparent fiscal cost of immigration with respect to welfare and healthcare benefits for poor immigrants in the early years of their US residency appears to be a significant factor in the short run, and it behooves us to bring such costs under better control, given our huge level of deficit spending. This might be done in a variety of ways, but in any case, it is not a trivial expense and should be a matter of concern for those who care about the level of indebtedness taxpayers must pony up to cover. Economic theory supports the idea that immigration should have a long-term positive impact on economic growth (cf. Sari Pekkala Kerr & William R. Kerr, 2011; National Academy of Sciences, 2017; Matthew Yglesias, 2017). Theory also supports the idea that there are immediate benefits from immigration in the form of returns to capital, estimated somewhat loosely at somewhere between $2.6 billion and $202 billion per year (cf. Howard F. Chang, 2018). However, there are also significant short-term costs expected from immigration for those native-born and earlier-arrived immigrant workers most likely to face direct competition from cheaper labor, which have been confirmed empirically (Chart 4) in some studies, but not confirmed in others (cf. Christian Dustmann et al., 2016). The disagreements in empirical studies are due both to sharply differing assumptions made in their analyses, and to differing parameters used in empirical measurements. In both Part I and Part II of the present series, I have opted to accept the results of George J. Borjas and his co-workers, who favor the idea that there are decreases in the returns to labor for some skill levels. Their empirical methods make sense to me and are fairly straight-forward. 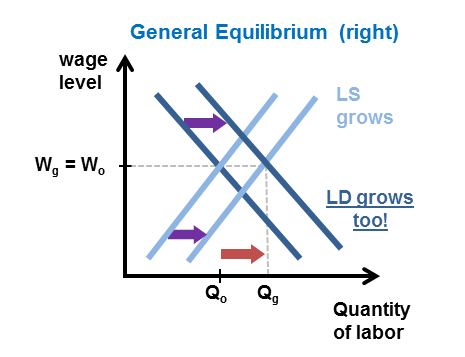 In any case, both of these effects (positive for employers and negative for some workers) are the result of a shifting supply curve (Chart 5) under an assumption of partial equilibrium (meaning demand does not change). Some economists think that this is wrong-headed (e.g., Timothy Kane, 2015). 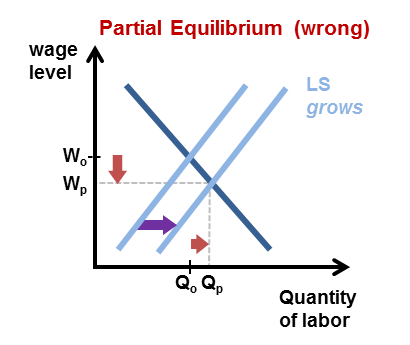 They prefer to assume that a full equilibrium exists, which allows both labor supply and labor demand to increase (Chart 6). The result under this assumption is that immigration has no significant effect on the returns to labor, theoretically. I find this hard to accept because it defies common sense in some circumstances, and it generally infers that labor demand exactly offsets all new supply, even though the supply is coming from outside the US and often comes in unexpected waves, and the demand is coming only from inside the US economic system. There also have to be time lags that are significant for the new supply vs. the new demand. I'm not an economist, so maybe my interpretation is naïve; however, economist George Borjas thinks it's obvious that there are measurable negative impacts from immigration for some cohorts of native-born workers (cf. George J. Borjas, 2016; Op. cit. ; 2017; Op. cit.). Others think that there are also negative impacts for earlier-arrived immigrants with poor educational backgrounds or lower skill sets (cf. Matthew Iglesias, 2017; Op. cit.). It is important to note that all these negative impacts do not last forever; indeed, the ultimate outcome after many years is net positive growth for both labor and the economy (National Academy of Sciences, 2017; Op. cit.). Part of the problem in analyzing the impacts of immigration on native-born workers and earlier cohorts of immigrant workers is the fact that the returns to labor have been left behind in recent decades relative to the returns to capital (Chart 7), which have soared (cf. Kevin Wilson, 2017). 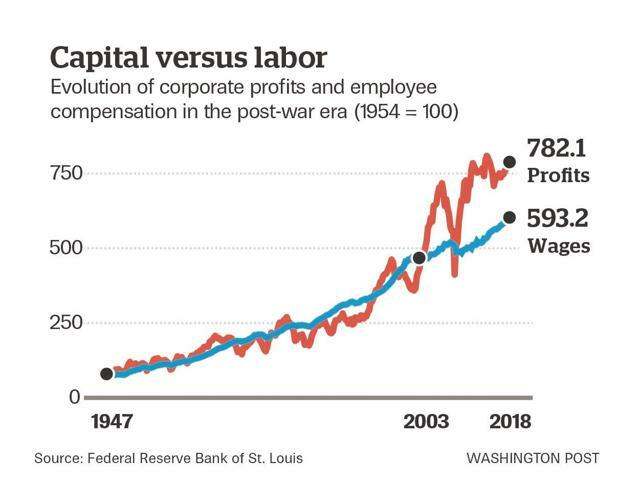 Globalization and technologically-driven worker displacement are major factors in this trend, as are the financialization of the economy and the extreme asymmetry of rewards in a winner-takes-all system that rewards a few with many millions or even billions, and almost everyone else with just a living. The long-term trend of lower returns to labor overprints the signal from immigration and is not easily removed from either the empirical data or theoretical models, although some researchers are at least aware of the problem (National Academy of Sciences, 2017; Op. cit.). Researchers have also built theoretical models of the world economy so they could estimate the gains that would accrue from eliminating various barriers to migration (e.g., Michael A. Clemens, 2011). Michael Clemens claims that these kinds of models demonstrate that removal of virtually all migration barriers would have an absolutely enormous positive effect on global GDP. In fact, a survey by Clemens of four separate modeling studies suggests that removing all migration barriers would be an order of magnitude more effective in boosting global GDP than the removal of all trade barriers and could have essentially doubled GDP from 2007 levels. Needless to say, these results are highly sensitive to modeling assumptions. These assumptions include the relative mobility of labor, the effects of skilled labor immigration, the mobility of capital, the elasticity of supply and demand, and the productivity of immigrant labor. However, even if these modeling estimates are taken as approximately correct, Clemens says this huge level of improvement would require epic migrations of billions of people to achieve the full increase, a completely unrealistic assumption. A survey by Michael Clemens of five model studies using only much more limited migrations (i.e., 1-10% emigration rates from sending populations) indicates gains to global GDP on the order of 1-22%, which is still trillions of dollars at the high end of the estimates. When we look at the huge income ("GDP") gaps between immigrants from poor countries (e.g., $16,700 per capita for China) and workers in rich countries (e.g., $59,500 per capita for the US), it does seem obvious that there are still substantial inefficiencies in the allocation of labor. Mitigating these would clearly increase overall GDP. Clemens admits, however, that this would have the effect of increasing returns to capital in receiving countries and simultaneously decreasing their respective returns to labor, at least in the "short" run. This is the key political constraint on the amount of immigration that could be allowed by countries like the US, regardless of the amounts deemed by economists to be "ideal." A truly substantial increase in immigration is thus "impractical," as Clemens points out. But the potential gains from increased immigration nevertheless have some economists dreaming of a better day. A later study (Michael Clemens & Lant Pritchett, 2016) explored the relatively new theory that restrictions to immigration are actually good because they prevent the transmission of low productivity to rich countries by unskilled immigrants from poor countries. These researchers point out that there is strong evidence supporting the conclusion that the same worker's labor can be much more valuable in one country than another. Workers from Central America can earn a "premium" of as much as 1,000% just by immigrating to the US. Indeed, as an example, McDonald's (MCD) employees could experience an order of magnitude difference in wages for doing the exact same job in different countries. The new theory favoring immigration restriction postulates that the low productivity of workers from poor countries can be transmitted to rich countries much like a disease; hence, it is also called the "Epidemiological Model." However, there is no empirical evidence whatsoever to support this model, and there are no compelling theoretical reasons to believe that low productivity transmission could even occur. Clemens & Pritchett are interested in determining what the optimal rate of migration (that would maximize global GDP) might be, and they have devised their own model to explore this question. They point out that when a highly skilled or educated immigrant becomes a billionaire or a Nobel Laureate in an advanced economy, it is in part because of the new opportunities available to him or her in that new country; thus, it is "outlandish" to believe that he or she would have achieved the same things in their countries of origin. Almost always, they immigrated for the specific reason of improving their opportunities, and then had the good fortune to eventually (usually after a lifetime of hard work), reach their goal. The model results of Clemens & Pritchett suggest that rather than gaining from immigration restrictions, as the "Epidemiological Model" speculates might happen, we instead lose. In fact, greater efficiency and higher GDP would be the theoretical result of reduced restrictions to immigration, according to their model. Others (often people from special interest groups) agree with the academic theories (e.g., Lena Groeger, 2017). 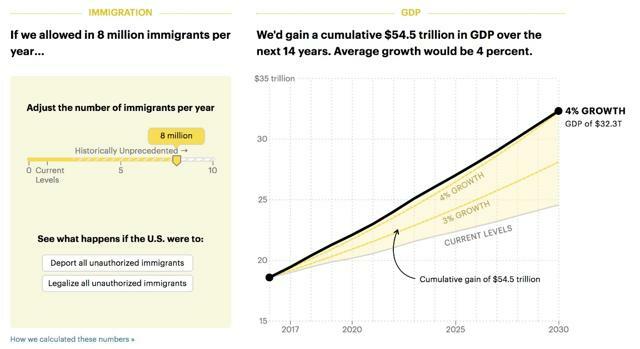 Some suggest that increasing total immigration from the current 1.4 million per year to a future 8.0 million per year would boost GDP growth back up to the 4% annual rate that President Trump (and most of the rest of us) would like to see (Chart 8). Thus, one of the main theoretical concepts with practical implications is the idea that population growth, strongly supported by immigration, is a key to future GDP growth. As I have already stated in the Introduction, "This is critical because the only two drivers for GDP growth are population increase and productivity growth, and both will have to improve for growth to rise above (and stay above) the rather tame levels of the recent recovery (i.e., the weakest one ever observed)." Because of declining birth rates in the mainly native-born American citizenry (Chart 9), population growth would likely turn substantially negative in the complete absence of immigration (Chart 10). 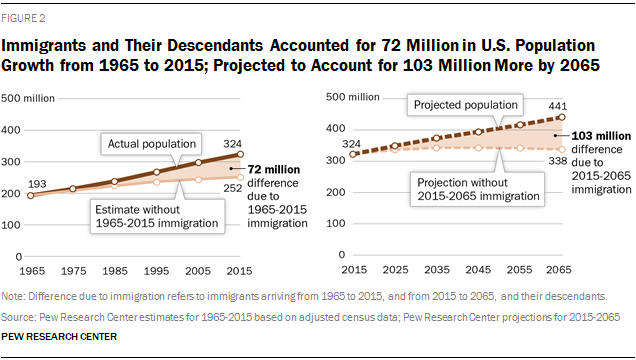 In fact, between 1965 and 2015, the US population increased by some 72 million immigrants and their descendants (Chart 11), and immigrants are expected to add another 103 million people to the American population by 2065 (Mark Hugo Lopez et al., 2015). The Social Security system may also depend at least in part on an improvement in demographics to maintain payments to retired workers at promised levels. 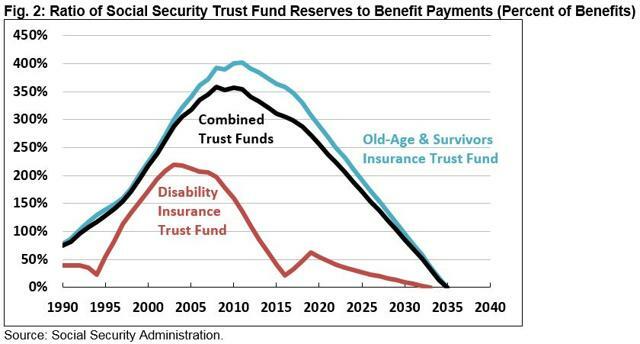 Recent analyses (Kelly Phillips Erb, 2018) project that the Social Security system will become technically insolvent by around 2035, assuming no changes in population growth, tax rates or long-term unemployment occur (Chart 12). This does not imply that payments will stop, but rather that payments will be made from a deficit position rather than the traditional surplus held as Trust Fund reserves. This would require either a payroll tax increase to offset the shortfall, or a direct cut in benefits, according to conventional calculations (Stephen C. Goss, 2010). Other options include measures that indirectly achieve the same thing: 1) increasing the retirement age; 2) cutting or eliminating the cost-of-living adjustment; 3) increasing the tax on benefits; and 4) covering the annual shortfall using money from the General Fund, and then selling Treasury bonds to either the public (increasing the total debt), or worse, the Fed (in order to monetize that debt), both of which have already been done at times (William Baldwin, 2016). Immigrants who pay taxes and have children who grow up and pay future payroll taxes could considerably ease the pressure on the Social Security system. As everyone knows, nothing much has been achieved by Congress regarding immigration reform since 1990 (cf. Howard F. Chang, 2018; Op. cit. ; Wikipedia, 2019a). Twice in recent years, either House or Senate Republicans have defeated bipartisan reform measures, first in 2007 and again in 2013. A bipartisan vote in 2006 actually funded the building of some 650 miles of border fence, and this has been shown to be quite effective (Kevin Wilson, 2019; Op. cit.). But now, Democrats have completely reversed their stance on border security and have repudiated the idea of building additional sections of border fencing. So, both parties theoretically favor the idea of reform, but the concept of border security has them stopped cold. Reforms proposed by the Trump Administration (the Reforming American Immigration for a Strong Economy, or "RAISE" Act) are anathema to Democrats and will not be passed by this Congress. Congress has also refused to pass a law authorizing the Deferred Action for Childhood Arrivals (or "DACA") program which was put in place (arguably unconstitutionally) in 2012 via executive order by President Obama. So, that program continues to hang in legal limbo. The two parties also disagree fundamentally on who should be allowed to immigrate to the US, with Democrats favoring the current family-based system, and Republicans favoring a merit-based system. Indeed, there are now so many issues that Democrats and Republicans disagree very strongly on, that there seems little hope of resolving them. Compromise will be necessary for anything to actually happen regarding reform. Neither side seems likely to budge right now, but events could change that. For example, one of the many illegal immigrant caravans attempting to breach our border security could actually get through. I don't know how public opinion would react to this, but it would definitely change the picture somewhat. President Trump would likely declare an emergency in that event and present a completed new section of fencing (after court cases are resolved) as a fait accompli to Democrats. Having accomplished the key campaign promise he had made to his constituents, he might then be more willing to give Democrats even more of what they want in the way of reform. President Trump is fairly pragmatic in general and has already shown he's willing to give Democrats at least a little of what they want, if he somehow also gets funding for a few hundred miles of additional fencing. The question is whether Democrats or Republicans have a broad reform in mind that could pass both houses once the fencing issue is behind us. If either side decides to leave it up to the voters in 2020, then we will see a replay of the debate in the 2016 election, and again the likely winner will be Trump, in my opinion. Be that as it may, are there other ideas that could get immigration reform to move onto the front burner in our chaotic political kitchen? One such idea is to set up a bipartisan commission with the agreement of Congress, with a mandate to come up with a meaningful budget proposal for border security (cf. Lucius J. Riccio, 2019). This idea might actually work better if instead of being limited to border security, the commission took on the entire issue of immigration reform. This idea is similar to the one that broke the longstanding impasse over military base closures some years ago, and it worked out very well. Yet another idea (courtesy of immigrant and author Reihan Salam) is for border security to be taken seriously (a non-starter for today's Democrats), as well as merit-based entry rules (another tough one for Democrats), but also to combine this with full amnesty (a non-starter for Republicans) for the 11-22 million illegal immigrants already here, and throwing in generous federal subsidies (another tough one for Republicans) for poor immigrant children in an attempt to break the cycle of poverty (Steven Malanga, 2018). Philanthropist Helen Krieble proposed something she called the "Red Card Solution" for handling the amnesty question back in 2013. This would involve giving illegal immigrant workers a type of temporary work permit ("Red Card") that would be renewable and could eventually lead to full citizenship under certain conditions (Ruben Navarrette, Jr., 2013). A very promising approach called the Preserving Immigration Legal Levels and Achieving Readiness (or "PILLAR") Act was proposed by outgoing Senator Jeff Flake last year (Reihan Salam, 2018). Under this reform law, family-based immigration would be limited to spouses and children (with those others already in line for family-preference slots grandfathered in), bringing that part of immigration under better control over the next ten years. But instead of allowing the number of green cards to decline as the backlog of applicants for family-preference visas clears, Flake's law would gradually shift the allocated number of green cards over to employment-preference categories. This would allow a gradual transition to a part family-based and part merit-based system. The amnesty nut would still have to be cracked, but the proposed "PILLAR" Act would potentially solve the long-term immigration problem and get things moving. As I mentioned in the Introduction, common sense would indicate that since immigration has always contributed to our economic growth via population increase, cheap labor, entrepreneurship, and invention, then the long-term effects of immigration are quite positive. Both empirical evidence and economic theory seem to support this conclusion. Long-term GDP growth and certain labor market efficiencies both result from immigration's positive impact on demographic trends and labor productivity. Returns to capital are significant and help to drive entrepreneurship, business investment, and invention. The Social Security system would also be better supported by higher rather than lower levels of legal immigration. In fact, lower restrictions on immigration and a significant increase in the number of immigrants allowed into the country are both favored by theory. The problem is that the politically explosive issue of lower returns to labor due to high rates of illegal immigration has frozen reform efforts to a standstill; thus, the inherent irrationality of our current hodgepodge of rules and laws continues as before. Reform will require compromise, innovative ideas for resolving some of the issues, and the patience to let it occur over a long transition period. There is reason to hope that if such a compromise includes a move towards a partially merit-based system, technology stocks (QQQ) will benefit greatly. The same is likely true for certain parts of the healthcare sector (XLV). Since there are already indications of a global recession and a US slowdown, it would seem prudent to adopt a very defensive portfolio posture if one is an investor, as opposed to a trader. In the end, I believe that those who own long-term Treasuries and gold will make a lot of money in the next 12-36 months, and those holding stocks will writhe in pain at their enormous paper losses. Allowing for human nature, most people will sell closer to the bottom than the top. A bull market for the US Treasury bond is historically the norm under these circumstances (Eric Hickman, 2018), and a strong one is likely again (Van Hoisington & Lacy Hunt, 2018). Given the current long-term sell-off from the January market high, the renewed sell-off from the October market high, and the state of certain national economies (e.g., China, Europe, Japan), it makes sense to invest some money in a gold fund like SPDR Gold Shares (GLD), but only as a short-term hedging trade, not a buy-and-hold position. The iShares Gold Trust (IAU) is an alternative ETF that may be safer for those who want to hold it for a somewhat longer period of time. But the safest form of gold in the event of a true financial apocalypse is physical gold. Also, for those discounting a possible near-term recession and bear market, some liquid alternatives like the Otter Creek Prof. Mngd. Long/Short Portfolio (OTCRX) could be held to protect assets in the event of a much sharper market draw-down associated with deteriorating economic data. Those in a more defensive frame of mind because of the expected eventual market slide should also hold some long Treasuries, in spite of bearish arguments to the contrary, as a stock market crash would be hugely supportive of bond prices: examples include the Wasatch-Hoisington Treasury Fund (WHOSX), and the iShares 20+ Yr. Treasury Bond ETF (TLT). Disclosure: I am/we are long GLD, OTCRX, WHOSX, TLT. I wrote this article myself, and it expresses my own opinions. I am not receiving compensation for it (other than from Seeking Alpha). I have no business relationship with any company whose stock is mentioned in this article. Additional disclosure: Disclaimer: This article is intended to provide information to interested parties. As I have no knowledge of individual investor circumstances, goals, and/or portfolio concentration or diversification, readers are expected to complete their own due diligence before purchasing any stocks or other securities mentioned or recommended. This post is illustrative and educational and is not a specific recommendation or an offer of products or services. Past performance is not an indicator of future performance.